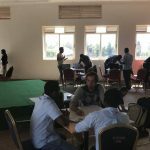 Meteo Rwanda in partnership with the United Nations Development Programme (UNDP) challenged technocrats to design a climate early warning system. The challenge focused on using the Internet of Things (IoT) to develop a solution. And due to TAHMO’s experience in building early warning systems, we were invited to mentor the participants. Gilbert (TAHMO and SWC) and Dominique ( CEO SWC) participated. In Uganda, TAHMO led the implementation of Global Resilient Project that developed a Meteorological Early Warning system for fishers and local population near Lake Victoria. An end-to-end solution was developed where weather information flows from the network of Automatic Weather Stations (AWSs) to big data analytics and all the way to millions of people via voice messages. TAHMO is also part of Tanzania Urban Resilience Program (TURP) to offer a solution in disaster preparedness and emergency management through early warning system. In this project, TAHMO installed AWSs and AWLs (Automatic Water Levels) in rivers and sites close to Dar Salaam. In Kenya, TAHMO is in a team building Integrated Real-Time Hydro-Meteorological Monitoring System in Nzoia River Basin. The goal is to have a functional flood early warning system. Rwanda is in need of a similar early warning system. At the moment, information flow from Meteo Rwanda to people is not very effective. Meteo Rwanda generates predictions then passes it to the Ministry of Disaster Management (MIDMAR) who details the information then shares it to the public. This one-way flow of information is often slow and no way of holding any institutions accountable. The public wants a way of giving feedback to the institutions, to help them improve their services and better tailor the information. But what does it take to design an early warning system? The UN international strategy for disaster reduction has identified risk knowledge, monitoring and warning service, dissemination and communication and response capacity as the key elements for an effective early warning system. So, when you start to think of developing a fully integrated early warning system, a number of questions come to mind. First is how data will be collected; which sensors do you use, will the data be reliable and does it meet the WMO standard? And how will streams of data from multiple sensors in multiple locations be handled? Then you will need to worry on how the data architecture will look like. How will you bulk datasets while continually maintaining the network running? You will then need to think about how data will be processed, information generated and disseminated to people. You will also want to ensure all the various components are properly coordinating and working together. 10 groups participated in the challenge: Binary Earth, ECODEV, Hugs for Bugs, Dream Team, FORTENA and FARMATE, STES, HUBTZ team, CLINFONOT, and EcODEV. All the groups showcased unique solutions within the data chain. On dissemination of information, solutions ranged from the use of a web app, mobile app, USSD, SMS, and voice to share data with all stakeholders. Some groups included advanced features to allow quick sharing of information and sending alert warnings to physical alarm device that warns people in proximity of disaster, while other groups included using Machine learning algorithms to predict the likelihood of a disaster occurring. Other groups showcased how weather parameter data could be uploaded using low-cost electronic sensors. Rwanda Ministry of Agriculture and UNDP. 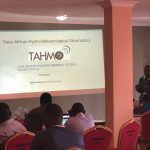 TAHMO is committed to establishing partnerships, sharing, and exchange of knowledge with institutions in the weather industry, with the goal of strengthening each other’s capacity.